L'Alpe is the long synclinal valley, and surrounding ridges, that stretches between the Roche de Fitta overlooking the Cirque St. Même to the south, and the col de l'Alpette to the north, which marks the southern end of the Granier massif - a distance of some four or five kilometres. It is separated from its neighbours by two prominent geological strike-slip faults both of which provide easy access to the area. The Tour de Chartreuse and GR9 follows the line of the valley (map). It is a beautiful area of predominantly alpine pastures and lapiaz. It is not overly dramatic, but it contains some wonderful walking, and the eastern ridge does have the high point of le Pinet (also known as Le Truc) which overlooks La Plagne, and which is a worthy destination. There are four main ways up into the valley. To the south, the GR9 ascends via the Pas de l'Echelle. To the east of there, another route reaches the valley more gently via the col de l'Alpe; in the north the GR9 enters the area via the col de l'Alpette from the west, and a fourth route ascends from the east via the Porte d'Alpette. Here we recommend a couple of more esoteric routes to the ridge from the the southern end, both returning by the Pas de l'Echelle, and one from the northern end. The last walk explores one of the sangles on the eastern flank, and returns along the eastern crest. 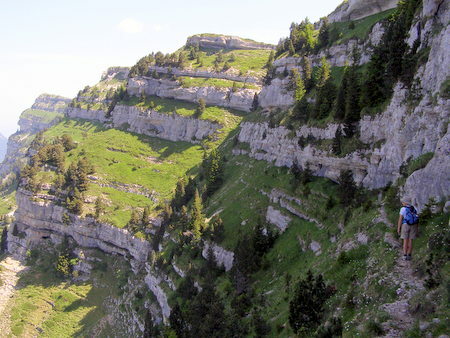 Like the Dent de Crolles, l'Alpe not only offers magnificent walking - it is also a place of pilgrimage for cavers with the Réseau de l'Alpe alone having over 60 km of explored passages, 35 entrances, and a depth of over 600 metres. Whilst most expeditions are for experienced cavers only, you should take the opportunity to take a look in the entrances of some of the more accessible caves. It's always worth taking a couple of lightweight headlamps with you.